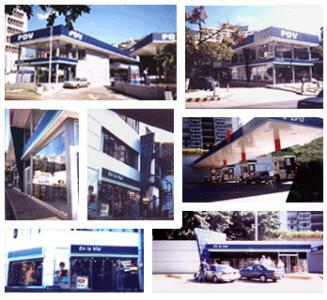 PDV NETWORK – CORPORATE IMAGE OF A NETWORK OF GAS STATIONS, CONVENTION STORES, OIL STANTIONS AND CAR WASH, TOGETHER WITH 16 SERVICE STATIONS. In 1997 I worked in the development of the corporate image for a new product of PDVSA service station (petroleum of Venezuela). We developed the manual for standardized constructions details, and build a series of service station all around the country. I personally designed and project-managed 16 service stations from conception to completion, some from scratch other complete renovations over old structures. They had gas stations, convention stores, some even had oil service and car wash stations among other commercial services incorporated in the same station. It was part of a bigger product to export, that stopped with the change on government and politic views. There were all build and are still being used.